So, not quite kicking off the retro project again…but will chip away. I need to first acknowledge that I didn’t put any real effort into either Wonder Boy 3 or Mickey Mouse Castle of Illusion as per “the plan”. I spent a little time with Wonder Boy, and far less time with Mickey. Ah well, the whole retro gaming project has been a spectacular failure…I’ll just accept it and move on. But before launching into R-Type, some words about WB3. Similarly to Alex Kidd, you start this game and you are exposed to something that looks so overly simplistic that your immediate thoughts are that it wouldn’t have much to offer. But, once again, you are soon surprised by the extent to which the designers have been able to craft an interesting and complex world into such simplicity. One of the main mechanics that stood out was the way that you are transported into different “levels” by entering different “huts”. This was quite a differentiating experience to games like Mario and Metroid. You are given multiple choices on how to attack the game world, which gives rise to some level of “dynamic thought” on how to best strategise your way forward. Lots of trial and error required…most of my attempts proved to be error. To be honest, I think WB3 outplayed me – I think my gamer skills are just not up to par with the challenge that WB3 put in front of me. So…R-Type…YAY!! 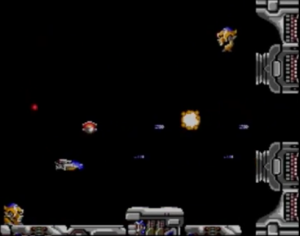 !…a SHMUP that brings back memories of the stuff I would gravitate towards at the arcades. R-Type incorporates the basic mechanics that one would expect of side-scrolling shoot ’em up (shmup). Changing terrain (that must be avoided), enemies that shoot, enemies with different behaviours / weapons, a “pew-pew” blaster and the ability to control your “R-9 Spaceship” to fly anywhere on the screen (with the exception of the boss fights…see below). 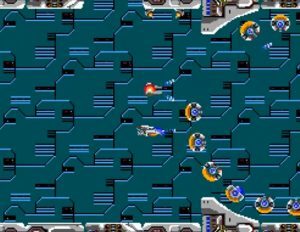 R-Type’s main differentiating mechanic, as far as I was able to determine, was the use of power-ups – this is where the creativity of the designers shined most. First of all, you need to remember that the Master System only had its D-Pad and two buttons (well, that’s what I had at least)…which doesn’t give much scope for mechanics one would think. The power-ups enhance your pew-pew blaster (aka pulse beam) and fundamentally “buffs” your ship to make survival a bit easier. So to start out, you have your main pulse beam energy weapon and each button mash fires it. Each enemy has a different amount of punishment it can take with the blaster before its dead. 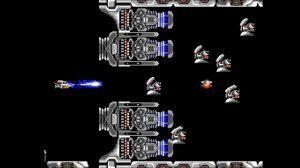 But instead of allowing the blaster to repeatedly fire “machine-gun” style, holding down the button charges up a “laser blast” that can, if timed well, take out several enemies at once. Killing the special alien known as “Bydo POW Armor” causes powerups to be dropped in the form of small “gems” or orbs. The first of which is the very cleverly designed “Droid Unit”. This droid (shown in the below pic as the glowing orange orb above the player’s R-9 spaceship) serves several purposes. First of all, the droid can be captured and attached to either the front or the rear of the R-9 depending on how the player flies / collides into it. When attached, the droid provides a small amount of shielding for the player. By tapping the second button, the Droid Unit can be detached – hitting the second button again will “request” the droid to fly back to the player. However, when detached, the droid unit also fires pulse beams giving the player extra “projectable” firepower. Also, in the process of detaching, and because the droid unit is not destructible, it fires forward and destroys enemies in its path, not dissimilar to the result achieved from the laser blaster. By continuing to collect these gems, the player’s ship will gradually be buffed through the addition of missiles, laser beams, a special “circular” laser blast, and supporting orbs that also fire. Naturally, these additional weapons make tackling the enemies, and in particular the bosses that much easier. So, that was the powerups. In the following I talk to more specific / smaller scope mechanics / dynamics observed. Dynamic. Trial and Error / Informed Pre-positioning. This dynamic was pretty much forced by the arcade nature of the game – its impossible to predict what the next sub-stage has in store therefore it is difficult to pre-position your ship with any specific certainty that it’ll set you up for success. Therefore you typically have to experience a sub-stage several times to work out a strategy for getting through. The “ring of enemies” is one of many specific examples. Mechanic. Constrained fighting space. Unlike the main levels, the boss fights (or at least the first one as that was all I was able to experience) were heavily constrained with respect to the room to move to avoid obstacles like the boss’s tail and the “blaster bubbles” that it shoots. This mechanic was constrained even further by the fact that there was level of “homing” to the “blaster bubbles” and that in order to score a hit on the boss, you need to fire from a very small defined space on the screen, timed perfectly to coincide with the boss’s tail moving out of the way. 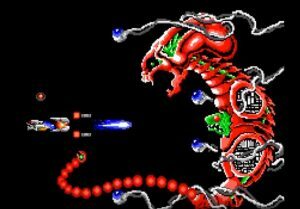 All this meant that it was quite satisfying when you eventually defeated the boss (especially if you hadn’t managed to build up you spaceship weapon powerups). Dynamic. The gameplay design for R-Type seem to force several different dynamic approaches to the game. And no single approach seemed to work in all circumstances. Sometimes, rushing through the enemy and staying as far to the right of the screen as possible helped to avoid enemies and missiles by effectively removing one of the four directions you needed to worry about. This approach was definitely more viable after “trial and erroring” sub-levels and where you knew before hand where the enemy would emerge. But other times, hanging back to methodically deal with enemies was the only effective approach. Mechanic. Just like classic shmups, enemy bullets/lasers/blasters come shooting from all angles, from flying enemies, enemies on the ground, and turrets on the roof and on the ground. This means your eyes need to be everywhere – you can’t just focus on what’s in front. Coupled with this, if you hit the terrain you die, and in some cases, the terrain can narrow significantly leaving little room for error. Basically its a visual overload! In terms of dynamic behaviour, when I was younger I recalled that often a good strategy for shmups like 1942 was to largely forget about the enemies…just blast away. 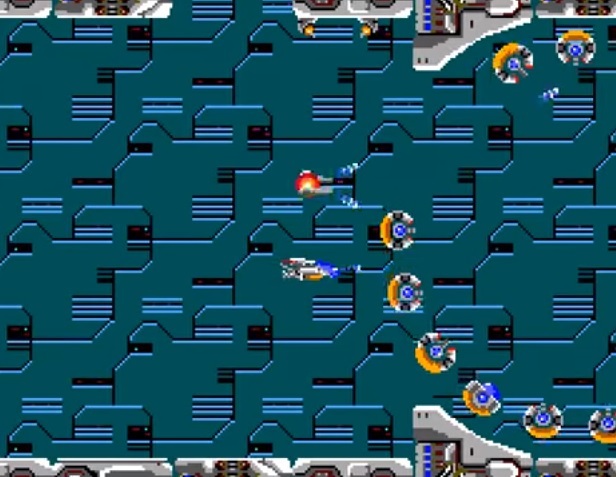 However, in forgetting about the enemies you would primarily focus on the screen in the immediate vicinity of the player ship with the primary aim of avoiding the bullets. I tried this strategy with R-Type…but I didn’t it work too effectively. So it was definitely a case of needing to readily absorb awareness of the complete level in order to deal with it. Mechanic. I got caught out a few times early in playing R-Type by getting shot in the bum. I mistakenly assumed that once I had flown past an enemy that it was no longer a threat. This mechanic was interesting as it acted to counter the dynamic behaviour of trying to “rush” through a level as mentioned above. Mechanic. “Constant physical engagement”. Unlike some arcade shmups, the player cannot simply hold down the trigger and fire non-stop. I recall that some games let the player do this, thereby reducing the gamer’s only “real” input to the control of the ship. As discussed above, this wasn’t so for R-Type – because holding down the fire triggers the “mega blast”. This means that the gamer is constantly mashing the fire button and therefore are more engaged with the game, not least physically. While this might cause some “itis” in the thumb, it feels more satisfying than would be expected if the gamer was simply steering a ship around and reducing the game to a quasi “maze game”. Dynamic. The Anti Gretzky. The famous ice-hockey player was quoted as saying something along the lines of “I’m a good player because I skate to where the puck is going to be, not to where it was”. One way of dealing with the chaos of bullets flying towards you would be the knowledge that the turrets and other enemies would tend to shoot at where you were, and would not attempt to shoot at a point reflecting a prediction of where you might be in the future. This being true of course for most weapons…but not homing missiles and boss “blaster bubbles”. Mechanic. Powerup Generosity. Especially prior to some of the more difficult stages, weapon power-ups were “dropped” with more frequency. This was especially true when continuing the game after losing a life – the player would respawn at a position that gave them a fair chance of picking up a handful of powerups prior to more difficult subsequent stages.